How Would Salt Affect Yeast? Yeast is a fungal microorganism that man has usedsince before he had a written word. Even to this day, it remains a common component of modern beer and bread manufacture. Because it is a simple organism capable of rapid reproduction and even faster metabolism, yeast is an ideal candidate for simple biology science experiments that involve the study of fermentation. Fermentation is the biological process by which yeast consumes simple sugars and releases alcohol and carbon dioxide. For the most part, fermentation requires a mostly aquatic environment to occur. Different yeasts respond differently to changes in environment, making some better for baking and others for brewing. 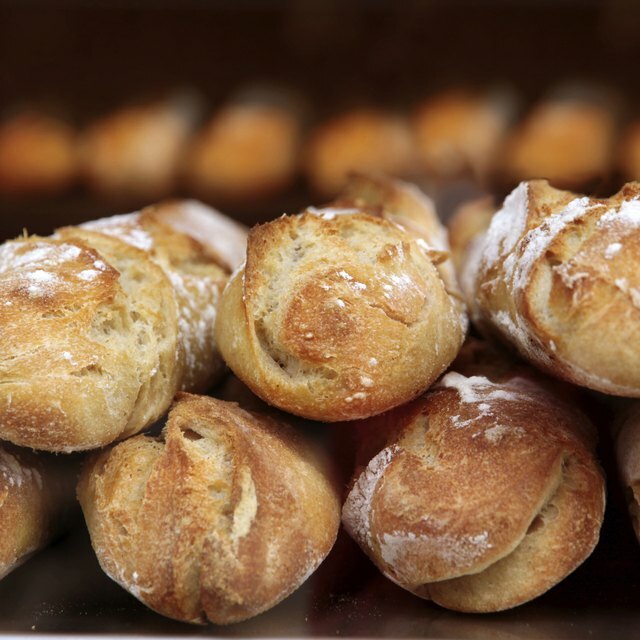 Bakers use fermentation to add CO2 bubbles to bread dough. During baking, these bubbles make the bread light and fluffy while the alcohol boils away. Brewers take care to preserve the alcohol of fermentation and use the CO2 to help build a frothy head for their potent beverages. The first experiment that should come to mind when examining yeast is determining whether or not yeast is a living organism. While it would be easy to rely on foreknowledge about the nature of yeast, more is learned by application of scientific method. If yeast is alive, it should consume food, respire and reproduce. Indirect tests look for clues that these processes are taking place. For such experiments, you should measure the amount of CO2 released by yeast that are digesting sugar water in test tubes with balloons attached. Use Benedict's solution to test for the presence of sugar in the final product. Fermentation is a delicate process that relies on ideal conditions to occur. Experiments that study how it responds to salinity are of particular interest to science and industry alike. Your project can either take a single type of yeast and vary the amount of salt in the solution to see if there is an ideal salinity, or alternately, use various yeasts to see how they respond to the same level of salt. In the latter experiment, make sure to use yeasts from many industries, since most baker's yeasts fare poorly in saline conditions. While it's clear that yeast requires sugar for fermentation, there are many different sugars that yeast could use for fuel. You can perform a number of experiments to determine which ones promote the highest level of yeast growth. In one, you can add yeast to various beverages, such as fruit juices and non-carbonated sports drinks to see which environment produces the most CO2. Another can use various sweeteners such as granulated sugars, syrups and nectars (such as agave) placed in weak solutions. You can measure CO2 production with balloons placed over the reacting test tubes, or simply observe the bubbles produced and make a relative comparison. Andy Klaus started his writing career contributing science and fiction articles to Dickinson High School's newsletters back in 1984. Since then, he has authored novels and written technical books for health-care companies such as VersaSuite. He has covered topics varying from aerospace to zoology and received an associate degree in science from College of the Mainland. Klaus, Andy. "Biology Experiments on the Fermentation of Yeast." Sciencing, https://sciencing.com/biology-experiments-fermentation-yeast-12027557.html. 09 March 2018. What Are Some Common Uses of Yeast?